[Chris] is quite the devoted tinkerer. He recently wrote in to share what can only be described as a labor of love. His Quad Delta Robot system has been in the works for about six years now, split into periods of research, building, more research, and rebuilding until arriving at its current form. 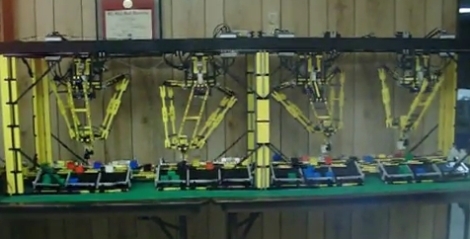 The system is made up of four Lego NXT robots which are tasked with sorting Lego cubes by color as they come down a pair of conveyer belts. The robots were built to mimic commercially available pick and place robots which can be found on assembly lines all over the world. Each robot operates independently, receiving signals via a light sensor which tells the robot where the next brick is located, as well as what color it is. This data is sent by the main NXT unit, which uses a lights sensor to determine brick color and position, relaying the information to the other bots via flashing LEDs. All of the robots receive the same signal, but much like NIC cards ignore frames not destined for their MAC, the bots ignore messages that are not addressed to them. The machine is truly amazing to watch – it’s clear that all of [Chris’] research and planning has paid off. You have to check out the video embedded below to truly appreciate all of the work that went into this system. Also, be sure to swing by his site for a far more in-depth look at how the machines work, it is definitely worth the time.